Charlotte Perriand was an influential designer and architect whose career intersected with many of the greatest French designers and architects of the 20th Century, and whose work is today admired and emulated internationally. From her early work with Le Corbusier and Jean Jeanerret, through collaborations with Ferdinand Leger and Jean Prouve, and years of war-imposed exile in Indochina, Perriand's remarkable spirit and dedication to new ideas and materials is a life-long testament to the power of the creative force. Indeed, her 1998 autobigraphy is titled Une Vie de Creation. Born the daughter of a tailor and a haute couture seamstress, Perriand spent much of her childhood with her grandparents in the Savoie region of France. This experience exerts on-going influence in her work that manifests as simplicity of design and function, and in her use of natural materials. She also returned to the region at times as architect of various projects, including several notable ski resorts. Perriand's stellar career began on an famously negative note when her application to the Paris offices of Corbusier & Jeanneret was rejected by Corbusier himself, who is said to have told her "We don't embroider pillows here." Undaunted, she designed the famous "Bar sous le Toit" display for the 1927 Salon d'Automne, which persuaded Corbusier to reverse himself and offer her employment. In the next two years she produced remarkable designs in collaboration with Corbusier and Jeanneret, most notably three iconic chairs: the LC2 Gran Confort, the B30 "Recliner", and the B306 Chaise Longue. In 1929, she designed the firm's famous "interior equipment of a dwelling" apartment in chrome and glass for the Salon, and in 1934, furniture and fixtures for Corbusier's personal apartment. By 1937, she had left that employment, co-founded the Union des Artistes Moderne, and worked with Ferdinand Leger utitlizing aluminum in the design of a pavilion for that year's Paris Exhibition. 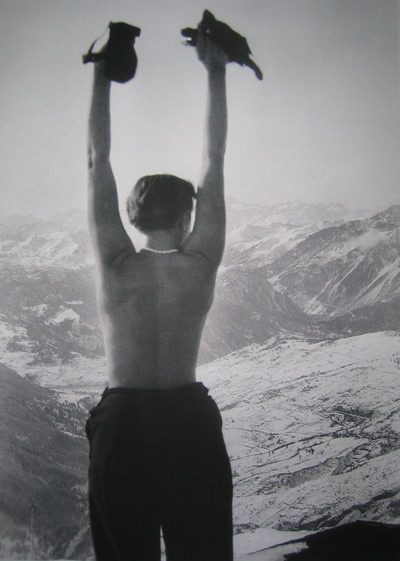 She also began work on her first ski resort in Savoie. Back in Paris in 1939, she worked with Jean Prouve on his project for pre-fabricated metal buildings. In 1940, she accompanied Corbusier to Japan as advisors on industrial designers to the Ministry for Trade and Industry. In Japan, Sori Yanagi worked as her assistant, and said in later years that his own work was highly influenced by this exposure to Perriand and Corbusier. Conversely, Japan and Yanagi's own reverence for traditional craft forms and admiration of simplicity and utility may be seen as an influence on Perriand's style. Expelled from Japan upon that country's entry into WW2, Perriand was marooned in French Indochina for the duration. During those years, she investigated traditional techniques and materials of the region, which she later combined with the regional forms of her Savoie childhood in designs such as her Bamboo Chaise and simple, solid wooden tables and seating. By 1946 she was back at work in France with Prouve, then Leger again. In 1951 she designed the French section of the Milan Triennalle, in 1957 the League of Nations building in Geneva, and in 1959 collaborated again with Le Corbusier (and Lucio Costa) on the Maison de Bresil at Cite Universitaire in Paris. In the next decades she was engaged in solo practice that included offices for Air France, a hotel, and more resorts in the Savoie. By 1985 she was so widely admired that her work was the subject of a retrospective at the Musee des Arts Decortif. Charlotte Perriand's career arc was high, wide, and historic: she has been credited with creating the chromed metal and glass idiom that is the hallmark of Corbusier's designs, somehow humanizing his cold rationality with her sensitivity towards everyday life. Her intuitive talent for discovery and application of new forms and materials resulted in a profound and consistent expression of modern values projected via minimalist designs. Perriand's spirit is perhaps best illustrated by the first promotional photographs of the B306 Chaise, in which Perriand herself is draped across the steel and leather sling, wearing a then-daringly short skirt, the curves of her back and hips echoing (and inspiring) the gleaming lines of the piece, while around her neck she wears a necklace of industrial ball-bearings, made to her own design.